One of the few highlights of the Turkish Grand Prix was Anthony Davidson's lap in qualifying that so nearly netted him a spot in the top ten on the grid. In the race itself, however, he lost places at the start and spent the rest of the time circulating fairly anonymously in what became 14th place by the end. It was typical of the bad luck that seems to dog Anthony. After hovering for many years on the edge of F1 as a test driver, 2007 was going to be his big break and we would see what he is really capable of. Unfortunately, every time he manages to get ahead of his team mate, Takuma Sato, and begins to impress, fate knocks him down again. The groundhog incident in Canada, that destroyed what was going to be a points finish, could only have happened to Anthony. It leaves us still unable to make a fair assessment of his potential. And it looks as though his chance to make an impact could be drawing to a close. In common with Spyker, the Super Aguri team has hit financial difficulties and, inevitably, rumors of the sale of the team begin. If that happens, who knows what would happen to Davidson? Sato's name has appeared in a number of silly season rumors of driver changes but poor Anthony never gets a mention. Not even Toyota are interested, it seems. In my opinion, those occasional flashes of speed show that Anthony can produce the goods when the car allows it. In the second half of the season he has generally been quicker than Sato, sometimes by a considerable margin, and his inconsistent form has been largely the result of outside influences beyond his control. It is quite likely that, given a seat in a more competitive team, he could shine just as brightly as some of the more hyped young drivers arriving in F1. Unfortunately, team managers seem to take little account of circumstances when assessing applicants for a driver's seat. What they want to see is results and, so far, it has to be admitted that Anthony has very few to put forward. Even if he had a large amount of money to offer as a sweetener, the only takers would be one of the financially-strapped teams at the tail end of the grid and Anthony already knows how difficult it is to make your mark driving an uncompetitive car. So the likelihood is that Davidson's experience of driving in F1 will be short, probably just this season in fact. That will not please at least one of my readers, I know, but it looks that way at the moment. F1 is a pitiless master and throws away many with talent in its endless search for the truly gifted one, the star of tomorrow. Once again, it shows that an essential item of equipment in a GP driver's armory has to be good luck. You can get by for a while if you have a bundle of money to offer but that will run out in the end or someone with an even bigger bundle will come along. There is just no getting away from it - as well as outrageous talent, you have to have luck. Clive must have written this one as a teaser for me......the one man Davidson 'fan club'. Sadly he may be right, Davidson was a flier when testing for B.A.R. but took the seat at Super Aguri when it became available.....so few testers ever get the chance at a race seat, but.......Super Aguri? Yes, I know they've got a lot of good media coverage topping parent team Honda on almost every ocassion but.....since Sato's pass on Alonso at Montreal Super Aguri have been coasting. All season I have complained about their qualifying pattern and poor Anthony has had troubles in first lap traffic. It takes 3 to 5 years to "mature" a driver in F1 and so few manage to last long enough to meet that threshold. The part that puzzles me is team management often drop someone like Davidson to sign some other no-name native......what benefit is that? Jaguar, and Toyota and Jordan and Minardi and Spyker and STR have all used the revolving seat technique and where are those teams today? Can't the mega-dollar management see this doesn't work? Davidson has five years in F1 cars, he has VALUE, why would ANY team throw that away? Dave Richards should have his eye on Lil Ant! Davidson and DeLaRosa, youth and experience, would be a good start-up team. Fingers crossed !!!! You know me too well, Number 38! I agree with all you say except that I'm a Gary Paffett fan and am hoping he gest one of the Prodrive seats. It's about time he had his chance at F1 too. The possible reason for the small teams using the revolving seat technique is finance - new drivers are cheap. But it works against the team in the end, just as you say. It's very rare for a new driver to make enough of a mark in a lesser team to be able to stay in F1 for long. Terrible waste of talent when you think about it. It might be a waste of talent for new drivers to get in at lower-ranking teams, but the alternative is for them not to get in at all. The manufacturers are reluctant enough to take on rookies in the first place. There are only two rookies in financially stable teams this year, and this will probably also be the case next year. The teams that do the revolving-driver policy are either doing it through driver mismanagement (OK, I'll agree with Clive and Number 38 that those teams have no chance of doing anything worthwhile) or because they have to to keep afloat (which was/is certainly the case with Jordan/Midland/Spyker and Minardi, and to some extent was true for Jaguar). In the latter case, it works because drivers often come with vast quantities of sponsorship (even more so nowadays), but that sponsorship only lasts for a set period. That period is rarely enough to last the 3-5 "maturation" years Number 38 referred to. If a driver is lucky, that sponsorship will be good for two years. As a result, the best a team can hope for is to hold a driver for two years, sell the contract to another team and recruit another moneyed rookie. No driver income = no team = fewer places on the grid. Given the conservatism mentioned earlier, that's fewer places for a new driver to go, and therefore less chance for someone like Davidson to stay. It's not right or fair that Anthony should be left in the cold, but until there is a way to get more financially secure teams on the grid, life will be very difficult for independents (non-manufacturer or Red Bull-backed drivers) like himself. The independent teams have been more or less driven out; independent drivers are next. Anthony Davidson will be like a desert flower - flowering briefly in one Honda team or the other, waiting beneath the ground for a long time before flowering again - but he'll probably hang around as a Honda/Super Aguri sub for a few years. 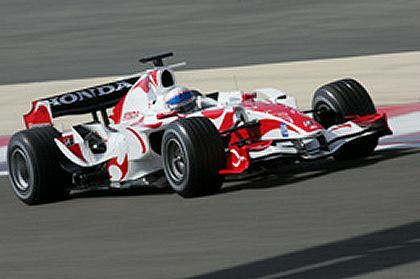 2007, however, will probably be his only full-time F1 drive. But at least he isn't out of pocket for having been there - something that can't be said about the numerous manufacturer-backed dropouts he raced against in lower formulae - and we've been treated to his skill. And one year of F1 is better than nothing. Gary Paffet? Just another nice guy that "deserves" a chance, blah, blah blah. It seems Prodrive are likely to buy McLaren chassis for 2008, there also seems a LESS than 50/50 chance Alonso will move from McLaren..... but if he did !!!!! McLaren would need Paffet, I can't imagine loosing Alonso and selling off Paffet. And even if Alonso and McLaren draw up a truce, you know that will only last thru 2008.......McLaren will still need Paffet. WHO has McLaren got in the pipeline? Your suggestion of Paffet instead of DeLaRosa.....that is Davidson and Paffet at ProDrive......but where's the long time experience? No team runs a one year novice and a no race rookie! Well, maybe Spyker or STR, but I've got higher standards, and I expect Dave Richards does also. Alonso going to ProDrive and McLaren moving up Paffet would make a few folks happy. SPECULATION......the game that never ends. Alonso to Prodrive? Well, that's one nobody else has thought of yet. It's an interesting thought, although I can't see Alonso doing it nor Dave Richards paying his salary. It would solve the Hamilton problem, however. But no, I think Alonso will stay at McLaren for 2008 and move thereafter. Which would give Gary the chance of the Prodrive seat and de la Rosa could provide the experience. Hmm, its hard to say for sure, but I suspect that if F1 teams throw away a lot of talented drivers in the search for the few incredibly gifted ones then Davidson's one year career may be par for the course. I've seen a lot to suggest Davidson is talented this year, but nothing to suggest he's gifted in the Alonso/Raikkonen/Schumacher/Hamilton sense. Mind you, I would have said that of Massa, and he could yet end up world champion. If you ask me, the really talented newcomer in a tailend car is Adrian Sutil. I was reading about... Oh wait a minute, that was in your Archives, Patrick! Yes, you gave your list of the top ten F1 drivers in 2006 - and Albers was in there. You had me totally convinced that he was hot stuff. And he might have been, were it not for the poor performance of the Spyker car this year (and if we'd been kinder to him about adding the refuelling rig as an interesting decoration to the car). But if Albers was good and Sutil was beating him comfortably every time out, how good was Sutil...? The trouble is nobody ever will know if somebody doesn't take a punt on Sutil next year. Maybe Toyota? Toyota and Sutil would be a good pairing, I think. Toyota would still have the experience of Trulli and a quick young team mate like Sutil could rejuvenate him, just as Kubica seemed to light a bomb under Heidfeld (although I say that was a coincidental improvement in the car). And Sutil would get a chance to show us his pace in a reasonably good car. It's a pity the Toyota board doesn't seem to have the sense to try a combination like that. I'm sure Davidson would do very well in sportscar racing, Neil. The main problem is that, like almost all the young drivers today, he wants to be and stay in F1. You can't blame him, really, it's all the hype around "the pinnacle of motor sport".